Jérôme D'Ambrosio spent one full season with the Marussia team in 2011, before being signed as reserve driver for Lotus. He appeared at the Italian Grand Prix for the Lotus team, replacing the banned Romain Grosjean for one race only. Jérôme first came to F1 as reserve driver for the Renault team for the 2010 season, and he was granted the opportunity to participate in several Friday practice sessions that year. He completed a full season racing for the Virgin team in 2011 with a string of consistent if not eye-catching finishes. For the 2012 season, he was replaced by rookie Charles Pic, leaving him without a race seat. 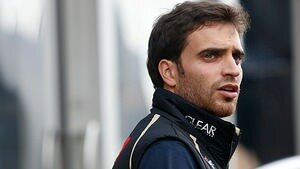 D'Ambrosio returned to the Renault outfit - now Lotus - retaking the reserve driver role. He participated in the Italian Grand Prix of 2012 in place of Romain Grosjean who was serving a one-race ban. D'Ambrosio remained in the test driver role for 2013 but left the team at the end of the year. D'Ambrosio was one of the drivers who participated in the inaugural season of the Formula E championship, and he remained for 2015 and 2016. Yellow flag. Jérôme D'Ambrosio has stopped out on track, the red car halted alongside the barriers.